If you’re a taco lover like I am, then fasten your seat belts, friends!! This Taco Casserole dish is SO fantastic, so full of flavor, it should be criminal! It’s like a happy bowl of taco-eyness alllll for you, just no taco shell or tortilla. A BOWL OF TACO. Multiple bowls, as it were, because this is made as a casserole and so taco bowls for everybody, yes!!! Ridiculously good, easy, and quite literally the Best Taco Casserole Recipe EVER on this and any planet! I promise! It has everything! The tasty taco spices, the delicious meat and cheeses, the southwest vegetable goodness, and the tortilla strips that add more punches of color and a little crispness to your plate! Especially when it’s all baked together, all the flavors meld together, and you’ve got this bowl of awesome in front of you that you devour before you can begin to process what’s happened! That’s why I know this is the Best Taco Casserole recipe out there! Because I made two pans and the family ate the entire first pan in one sitting! No joke! We are no strangers to making delicious taco-themed dinners at home. Recently we made a delicious easy taco soup recipe that rocks our socks! And for your taco-ey southwestern pleasure, we have an easy salsa enchilada chicken recipe as well as slow cooker enchilada chicken, creamy chicken enchiladas verdes, shredded chicken taco salad wraps, and savory pork carnitas! We’ve also got chicken bacon ranch taquitos, our award-winning homemade chili recipe, our chicken tortilla soup recipe, and more located in our dinner recipe index! Also, consider making our awesome corn bread recipe to serve alongside this Taco Casserole dish! It’s simply delish! And check out my friend Mel’s Taco Tater Tot Casserole she made! I’d love to sit here and continue singing the praises of this amazingly awesome Best Taco Casserole Recipe, but I won’t any longer! 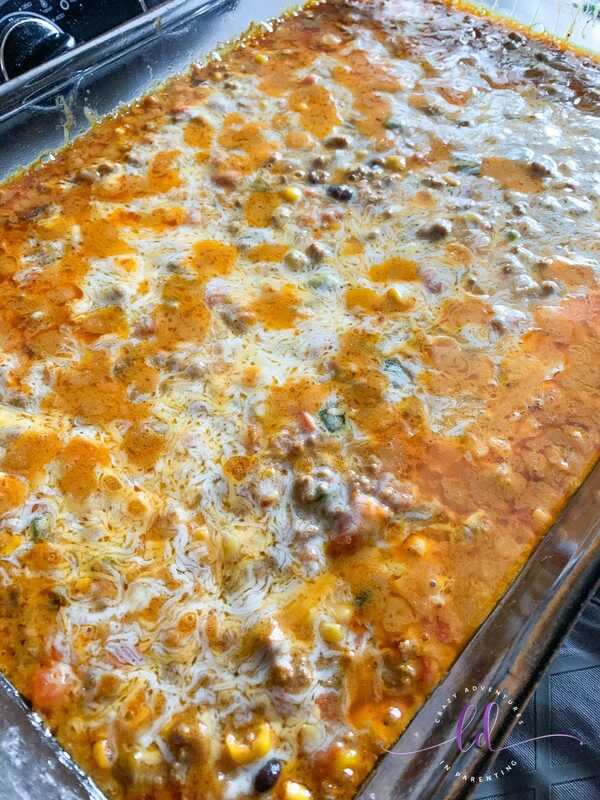 Go ahead and gather your ingredients listed below, along with your all important kitchen utensils and such, and let’s get to cooking this Taco Casserole amazingness right now! You are just going to love this! Once the refried beans are hot, spread them out over the entire bottom surface of your glass 13×9 baking pans that have been sprayed with cooking spray. Ensure the layer of refried beans is flat and evenly spread in the pan with a rubber spatula. Using another rubber spatula, stir your ground beef until it is fully browned. Add taco seasoning packets to the browned ground beef. Add water to the taco seasoning and ground beef. Mix to blend your taco seasoning and water with the ground beef and simmer until the water starts to cook away and the meat gets saucy. Add the bag of southwest vegetables to the ground beef mixture. Stir your meat and vegetables mixture around to fully cover the vegetables in the taco sauce, beginning to heat the vegetables through. Should you determine after stirring in the vegetables that you’d like extra vegetables added, which is completely optional and up to you here, you can choose to add another bag of the southwest vegetables or add more corn to your mixture. Stir all the vegetables to cover completely and cook thoroughly. Add Rotel to your vegetables meat mixture. Stir thoroughly to combine all ingredients and let simmer to cook off some of the excess moisture. Once you are satisfied with the sauce level left in the pan after cooking your ingredients thoroughly, go ahead and scoop your taco meat mixture into a large bowl with your large spoon so you can add cheese and mix comfortable without spilling. Add copious handfuls of shredded cheese and stir until the cheese is well-melted and combined. Add this cheesy taco mixture to the layer of refried beans in your baking pans. Layer evenly across the top. Look at all that delicious ooey gooey cheese already! Ensure the taco mixture is even across. Sprinkle lightly more shredded cheese over top. Ensure the cheese is evenly spread on top before baking. Cover your pans with foil and bake in the oven for about 10 or so minutes. (Remember, this was already cooked fully on the stove, we’re just heating this until it’s cooked altogether now.) Remove from oven and remove foil. Top with tri-colored tortilla strips (which add even more color and taste amazing). Once you feel the dish is sufficiently topped with the cheese and tortilla strips, bake uncovered for another five minutes to brown the toppings slightly. Remove it from the oven and gaze upon it, appreciating the gorgeousness as you let it cool slightly before serving. You will find it’s served in a bowl! We served this over cheesy rice, but you can also serve it over regular tortilla chips, with taco shells, flour or corn tortillas – the deliciousness never ends! Full detailed recipe with measurements you will find below, as well as a pinnable image should you want to share it and save it for later (and I hope you will)! I hope you love making this for your family as much as I loved making it for mine! Be sure to let me know what you and your family think when you make it, I love hearing feedback on our recipes! Once the refried beans are hot, spread them out over the entire bottom surface of your glass 13×9 pans that have been sprayed with cooking spray. Ensure the layer of refried beans is flat and evenly spread in the pan. Once you are satisfied with the sauce level left in the pan after cooking your ingredients thoroughly, go ahead and scoop your taco meat mixture into a large bowl so you can add cheese and mix comfortable without spilling. We went a little crazy with our tortilla strips, but they taste REALLY great on top! Look at that gorgeous color, can you blame me for going crazy with it? Once you feel the dish is sufficiently topped with the tortilla strips, bake uncovered for another five minutes to brown the toppings slightly. Remove from oven. Appreciate the gorgeousness and color in this dish as you let it cool slightly before serving. Best served in a bowl! I served this over cheesy rice, but you can also serve it over regular tortilla chips, with taco shells, flour or corn tortillas – the deliciousness never ends!